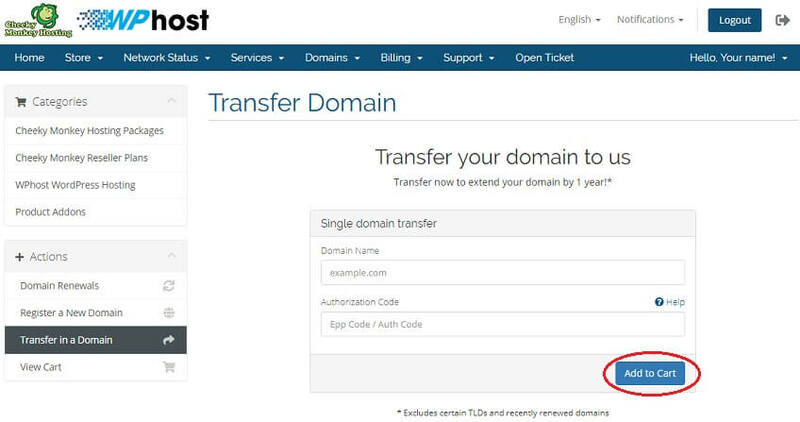 How do I transfer my domain names to you? To transfer your domain names to us you will first need to obtain the "UDAI Code" (for .nz domain names) or the "EPP Key" (for TLD domain names) for each of the domain names you wish to transfer. Your current registrar must provide the UDAI Code or EPP Key to you upon request, or they may provide a facility on their website for you to request this information. Top Level Domain Names (.com, .net, .org, .biz or .info) also require that the Registrar-Lock be removed before the transfer to another registrar is allowed - this registrar-lock can be removed (unlocked) through the existing registrar. Please unlock the domain before continuing with these steps. Next, login to your Client Area. Click Domains, and then Transfer Domains to Us. Enter the domain name to transfer together with the UDAI Code or EPP Key that you have obtained from your current registrar and click Add to Cart. Configure your domain and click Continue. Review your order and click Checkout. How do I upgrade my hosting package?